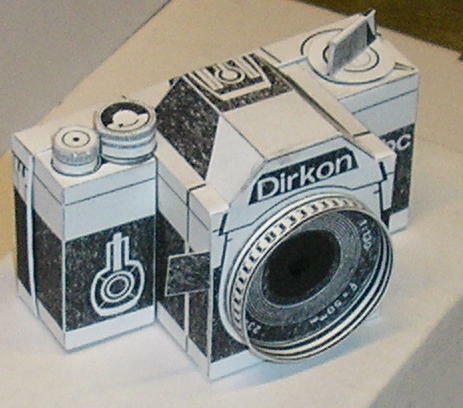 Dirkon Paper Pinhole Camera - and it works! 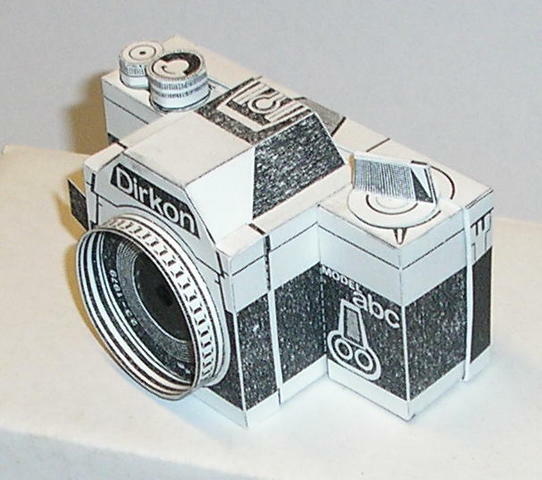 What do you give to a colleague who is leaving work after many years, is a camera enthusiast, and I enjoy making quirky paper models? 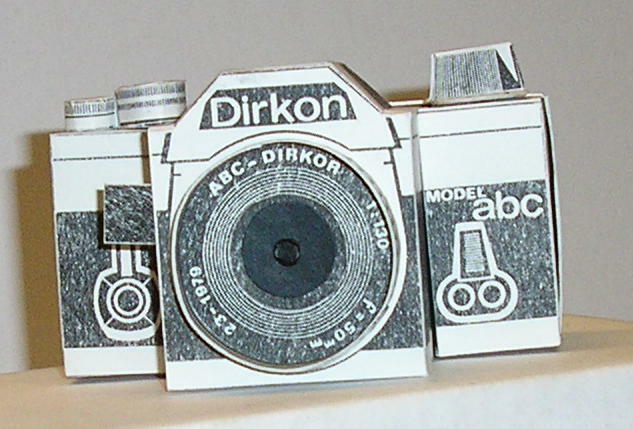 Obviously a paper model camera! I went hunting and found a free plan on the Net. 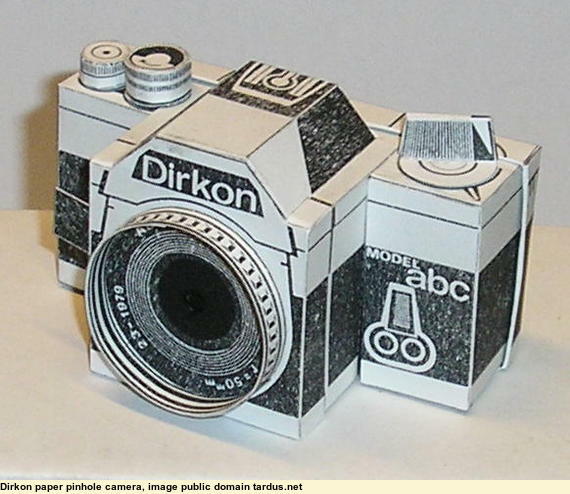 Not only is this one a good imitation of a quality SLR camera, it actually works. 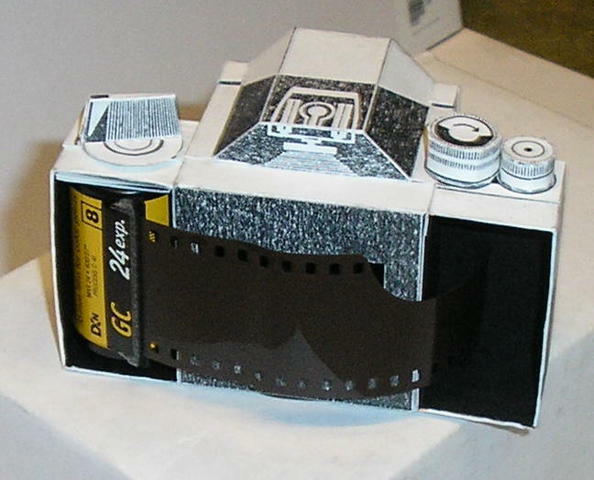 It is in the category of pinhole cameras. You expect a camera to have a lens, but in fact it is not essential. Optical theory and practice show that the distance the subject has to be from the camera is dictated by the size of the aperture. The larger the aperture, the closer the subject needs to be to the ideal focal length of the lens. If you can keep the aperture small enough, almost everything is in adequate focus. If the hole is very small, like a pinhole, the focal length of the lens becomes immaterial, and you can do without a lens at all. I was impressed by the precision of the parts once cut out. Fit was excellent, and it went together with no hassles. He was delighted with it - took it around at the staff farewell we had for him, showing people. Turns out he had been thinking about pinhole cameras. I think it was going on display at the stall he runs at a camera buff's market, but definitely not for sale.